The Sir Robert Frost and Bishop Desmond Tutu Interview! A Lesson To Learn For Israel – and Others To Revisit! Please Reread The History Books!! The Nobel laureate on his role in South Africa’s struggle against apartheid and his alarm over recent developments. Archbishop Desmond Tutu, the famous Nobel Peace laureate, and one of the world’s most respected church leaders, was a central figure in ensuring an end to white minority rule in South Africa. He was instrumental in the struggle against apartheid, also acting as chairman of South Africa’s Truth and Reconciliation Commission (TRC). He has since gone on to play a role as one of Nelson Mandela’s handpicked ‘Elders’ along with others like former US President Jimmy Carter. The archbishop takes Sir David Frost on a tour of his beloved South Africa; he talks about his time in the anti-apartheid struggle movement, his work with the TRC, and his alarm over recent developments in the “rainbow nation”. 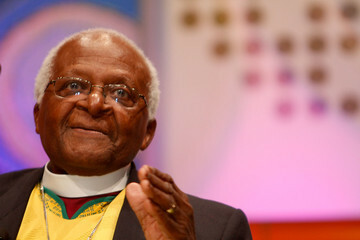 As a defiant campaigner against apartheid, Tutu is one of the world’s most prominent defenders of human rights. “We’d just come back from England with our youngest child. The youngest was born in London and she saw some children playing on swings and she said, ‘I want to go and play’ and, we had to say, ‘No sweetheart, you can’t’. Tutu hails Mandela as an “incredible guy!” – after all Mandela was a prominent participant in the negotiations that led to South Africa’s peaceful transition from apartheid to democracy. 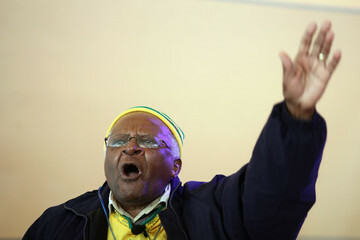 Moving forward, Tutu expresses his concerns about the direction the current government in South Africa is headed. He has also become more outspoken about his criticism of the ruling party, and the rainbow nation, of what he was once so proud. “We are a wounded people” Tutu says, recalling the painful testimonies he heard as chairman of the TRC hearings. The Frost Interview can be seen each week at the following times GMT: Friday: 2000; Saturday: 1200; Sunday: 0100; Monday: 0600. His home was destroyed by the Apartheid Regime because of his stand! The Apartheid Regime behaved exactly the same as Zionist Israel (Benjamin Netanyahu) is behaving now! That they were always right, correct, ethical and perfect – others not and inferior peoples and race – and one can do what they wanted with them! History is on the side of The Arabs and The Palestinians – and time and history will prove that to be correct! They will win one day! Anyway The Arab World has now changed – not what it was before The Arab Spring! Biggest casualty is The Truth! And future relations between Nations – starting with our current Youth! They will not forget – They will remember! We pray for sanity, reason, pragmatism and sense and responsibilities! People are already tired with costs and hardships of living – we see demonstrations and protests all over the world now – even in Western Europe and even Israel – and USA too! People should learn to live together in this globe in peace, harmony, tolerance, patience and understanding – Live and Let Live! We owe it to our future – history – legacy – destiny and future! One should not make a bad state of affairs turn even more nasty and worse! Applies to ALL! God CURSE those that use babies, children and women killed and maimed as Collateral Damage!